According to a New England Journal of Medicine article titled Recent Developments in Radiotherapy, it is estimated that 470,000 patients receive radiotherapy each year in the United States1. As many as half of those will receive radiotherapy for cancer. Radiation is a common treatment for some cancers by using high-energy particles or waves, such as x-rays, gamma rays, electron beams or protons to destroy or damage cancer cells. Defining the extent of a tumor is a critical first step in defining and planning radiation treatments since accurate location reduces the chance of unintentional radiation exclusion or inclusion. Various internal body parts including lungs, esophagus, liver and so on move with breathing, and respiratory motion varies daily, affecting the defining of the treatment field. The amount a tumor can move during breathing can vary widely as well. Simply adding treatment margins to cover the limits of motion or increasing irradiated volume is neither safe nor recommended as this results in an increase in the volume of normal tissues being exposed to high dose treatment. One method to overcome the problem of tumor movement in patients treated with radiotherapy is to restrict tumor motion with the Active Breathing Coordinator™ (ABC) device. The Active Breathing Coordinator device increases the accuracy of the treatment by reducing the amount the organs in your chest and abdomen move by holding your breath for you. It’s a non-invasive device designed with a mouthpiece that is attached to a digital spirometer to measure the respiratory trace. The patient’s nose is pegged as well to prevent nasal respiration. The technique requires comprehensive quality assurance procedures to ensure precise readings and treatment delivery. Until recently, the accuracy of the Active Breathing Coordinator and quality of results had to be assessed and manually verified. Manual testing typically involves checking the flow-sensors for holes, clogging, channel plugging, or excess moisture. The use of hand-held syringes to complete these tests had several drawbacks, including the inability to test the balloon valve functionality, difficulty in replicating the patient’s breathing and operator error such as pushing too fast or too slow and causing false readings. Constant or heavy use meant more frequent checks and testing which had the potential to decrease the number of patients that could be seen. Now, performance accuracy and functionality of the Active Breathing Coordinator’s spirometry and balloon valve can be tested in under two minutes with the RoHS compliant Aktina SpiroCheck Duo® quality control device. 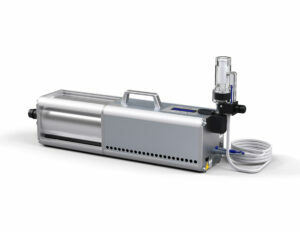 The extremely accurate system features a precision machined piston with a 1.3-liter calibrated volume connected to a linear actuator, creating sinusoidal tidal volume. The completely automated front panel LCD displays clear results. PC connectivity allows for creating and printing of QC reports and retrospective analyses. While QA/QC policies and procedures for ABC usage may differ from medical facility to medical facility, the quality control procedures enabled by the Aktina SpiroCheck Duo device ensures the facility knows exactly how the ABC is performing each and every time.